Sometimes a glass of wine is all you need. Other times, well, you want the whole damn vineyard. And while there are hundreds of Napa Valley wineries that'll satisfy that urge, we've unearthed a brand-new one nestled up high in the Howell Mountain hillside that ought to be on the top of your must-visit list. Welcome to Cade—Napa's newest and California's first gold LEED-certified winery and tasting room brought to you by the hotshot duo of billionaire Gordon Getty and Mayor Gavin Newsom, opening its doors Wednesday. About five miles off the Silverado Trail and a few hairpin turns in, Cade will be your secluded mountaintop destination for Sauvignon Blanc, Cabernet and Tahoe-esque views that rival the ones at the deck at Auberge. Start with a tour of the winery, which isn't just solar-powered but also insulated using old blue jeans (hopefully vintage denim…)—and when you enter the caves, you'll see more than a thousand barrels inspiring the winery's name—a Shakespearean term used for an oak barrel. 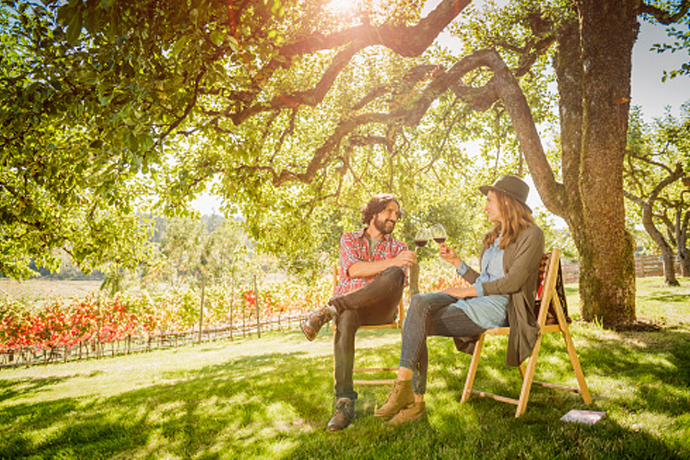 After walking through the cave's maze and back to the tasting room, you'll have the option of drinking while sitting by the waterfalls overlooking the valley in the summer, or fireside come winter. 360 Howell Mtn Rd S.